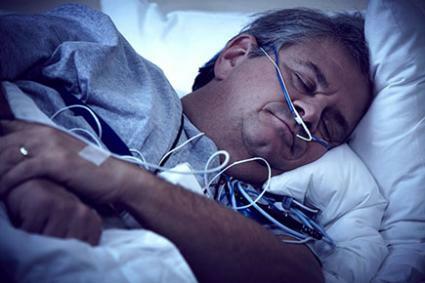 Obstructive sleep apnea can be tested with a home test. This method allows you to monitor your airflow, breathing, snoring sounds, and head and neck movement from the comfort of your own home. It is used as a diagnostic tool that can help you determine the next steps to treat sleep apnea and get a more restful sleep. If you want to do your own test at home, it is important to meet with a board certified sleep specialist at a sleep disorder center that is accredited by the American Academy of Sleep Medicine. The specialist can help you determine if the home test is right for you. Home tests are for people who cannot attend a sleep center due to work or family constraints, disability, health and safety concerns, and lack of locations in proximity to home. Health: You must have no other major medical problems, as these can affect the results of the sleep test, such as a past history of a stroke or obesity hypoventilation syndrome. In addition, there must be no other sleep disorders present, such as restless leg syndrome or rapid eye movement disorder. Age: You must be at least 18 years of age and no older than 65. Sleep tests are not recommended for children. Severity: Your pre-test evaluation must determine that you have might have moderate or severe sleep apnea. Symptoms may include loud, frequent snoring, daytime tiredness, obesity, and breathing restrictions during sleep. A sleep test taken from home includes a simple device to use. The device is light and usually comes in a carrying case. Typically, there will be a strap you wear to hold the device to your chest, a tube that goes under your nose, and a finger sensor. You will be asked to place several sensor pads on your chest. Complete instructions are included when you receive the test, which is easy to use and only requires that you get a good night's sleep. On the night of your testing, you'll want to sleep for at least six hours and let your sleep specialist know if you weren't able to sleep and need the device for another night. To get the results of the test you'll need to return the device to your physician, test provider, or sleep center. According to Medscape, home sleep tests are just as effective as a polysomnography (in-lab sleep test) to detect sleep apnea and its severity. Moreover, as Medscape found, the treatment plan for sleep apnea did not vary when comparing home sleep tests to polysomnography. Convenience of performing a self-test at home is a factor, which helps to reduce the likelihood that a person cannot sleep because the person is in unfamiliar surroundings. The costs are a fraction of sleep tests performed in a sleep lab. A home sleep test is ideal for people who have mobility issues. Results of this test are comparable to the results conducted overnight at a sleep center. The main drawback is that you won't be able to monitor your vital signs during sleep, which can be done during a traditional test. The home tests can't check for limb movement or other sleep issues, as they are designed specifically to diagnose obstructive sleep apnea. Home tests do not provide data to diagnose for other disorders, such as parasomnias and nighttime seizures. Medscape also notes tests are sometimes inconclusive because the patient, due to improper instruction, has not used the equipment properly, or the equipment is not able to function properly. It's possible that you do not have obstructive sleep apnea. In this case, you will most likely have to have a lab sleep study to assess whether or not you have another type of sleep apnea. Many insurance plans will not cover a polysomnography, but will cover a home sleep test. Work with your insurance carrier and medical service provider to determine if you will have to pay out of pocket for your home sleep test or if you will have any out-of-pocket costs. SleepMed sells home testing devices. They have a free online risk assessment and information on how to order a home sleep test. The Novasom QSG offers information for patients about sleep apnea and a free online questionnaire before ordering. No matter which obstructive sleep apnea test you take, be sure to share the results with your doctor or certified sleep specialist so that you can get the proper medical treatment. They will be able to help you find out what condition you have as well as what you need to do to manage your condition.